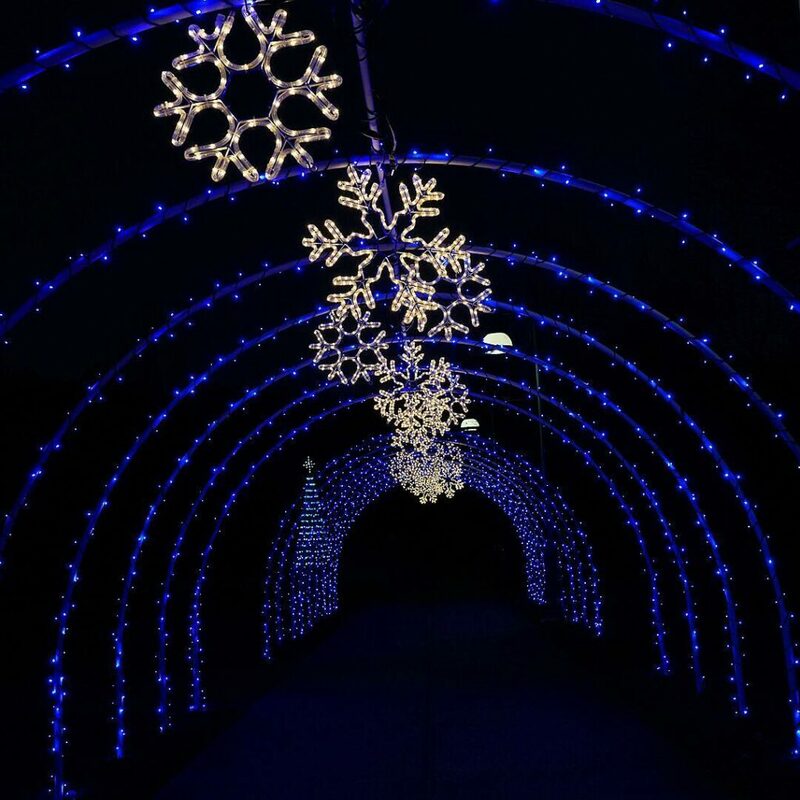 The North Carolina Arboretum continues the tradition started in 2014 of winter lights. These turn the garden into a winter wonderland. Every year new displays are added, and there are now half a million lights. These are efficient LED lights, using 80% less energy than ordinary lights. So even though they are spread over three acres of gardens, they don’t use much more energy than a typical home. This event takes a lot to run, with an estimate of 12,500 hours to design, set up, and take down the lights, along with people to help control the chaos of the nightly visitors streaming in to see the display. This year it began on November 17 and continues through the end of the year, from 6 to 10 PM every night. If you are in the area, I’d strongly suggest adding it to your calendar. I visited this past weekend, enjoying the new and old displays. This arch always entrances me, emerging as if by magic from the night. The fanciful snowflakes seem to float above the deep blue pathway, glowing in the darkness. Though I have visited the garden many times, there is an elemental quality in these explorations by night. The holiday lights lend an otherworldly feel, and I see new perspectives when the garden is pared to silhouettes. Ironically, sometimes it is in the dark when things are reduced to shapes and outlines that we see them most clearly.